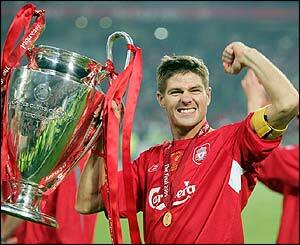 This is an un-official website dedicated to Liverpool and England midfielder Steven Gerrard. Steven Gerrard is not only the best midfielder in world football, he is perhaps the most perfect. He's great defensively with his strong running, tackling and great heading ability. In attack, he passes short and long with precision accuracy. He also reguarly scores goals, usually spectacular goals! On and off the pitch, he's a model professional, which makes him the ideal person to captain Liverpool football club and vice-captain the England national football team.